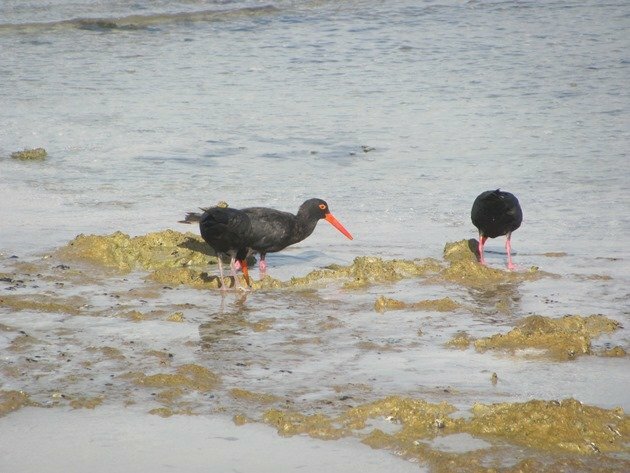 The Sooty Oystercatcher Haematopus fulginosus fulginosus is present in an area along the coast of Western Australia roughly south of Carnarvon and to the north the Sooty Oystercatcher is the sub species Haemotopus fulginosus ophthalmicus. 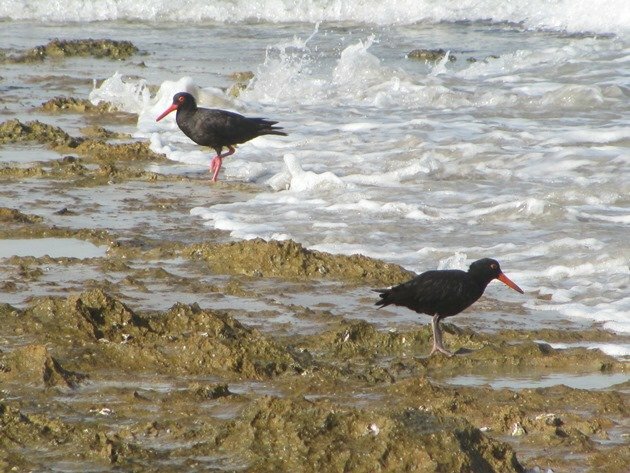 We rarely encounter family groups of Sooty Oystercatchers Haemotopus fulginosus ophthalmicus at home in Broome, but more commonly we encounter a flock of approximately thirty non-breeding Sooty Oystercatchers at the northern end of Cable Beach. On our recent trip away we encountered a family group of Sooty Oystercatchers at Kalbarri and they were feeding on the reef along the coastal strip of the Kalbarri National Park near Blue Holes. There were two juvenile birds with pale pink/grey legs and with some darker colouration at the end of their bills. They fed in close association with their parents and were no doubt several months old. 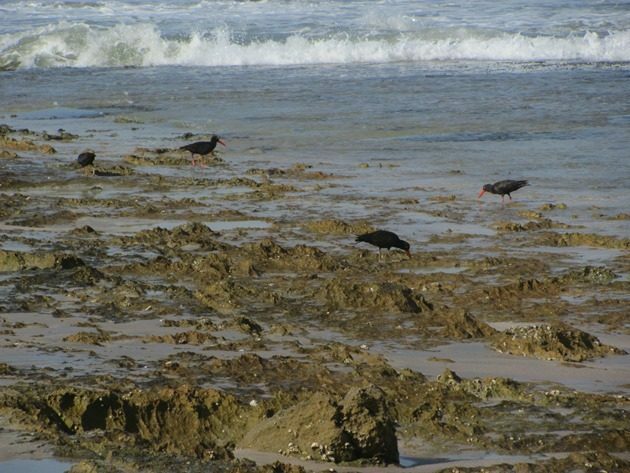 Sooty Oystercatchers prefer rocky coastal areas to sandy beaches and there is good suitable habitat around Kalbarri. The Sooty Oystercatchers diet consists of mussels, limpets and chitons and they are often seen chiselling away with their powerful bills at the rocky outcrops. 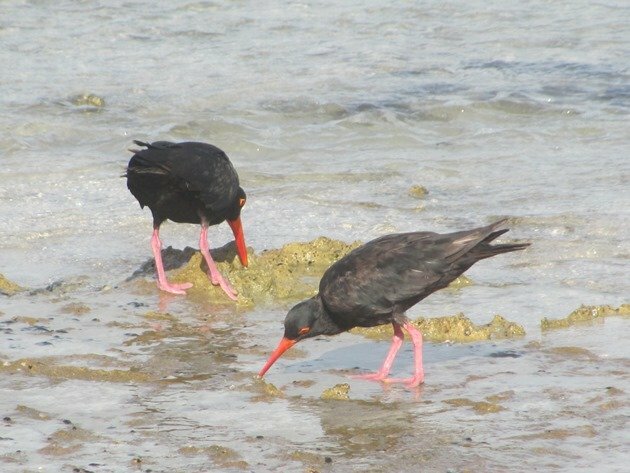 Sooty Oystercatchers are sometimes seen in association with Pied Oystercatchers, but the Sooty Oystercatchers are distinct by their completely black colouring. 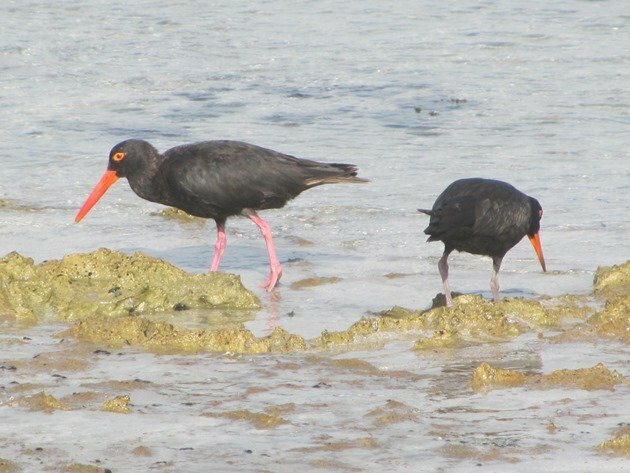 The two distinguishing differences between the two sub species of Sooty Oystercatchers in the north and south of Australia are the presence of a yellow orbital ring around the eyes in the northern species Haemotopus fulginosus ophthalmicus and the dark claws. In the south of Australia the claws of the Sooty Oystercatcher are very pale and the eye is bright red. There is however hybridisation on both the west and east coast of Australia where the two sub species overlap. 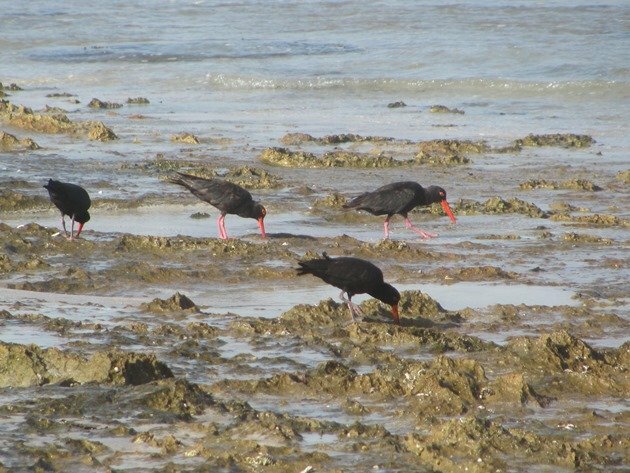 The photo below is of adult Sooty Oystercatchers in Broome with their distinct yellow orbital ring around their eyes and black claws. It is currently believed that the population of Haemotopus fulginosus ophthalmicus is around 7500 and that the population of Haemotopus fulginosus fulginosus is around 4000. The bill of the female Sooty Oystercatcher is slightly longer and narrower than the male bird, which is also apparent in Pied Oystercatchers. Oystercatchers in general in Australia are much more inclined to walk off rather than fly and this family were more than happy to let us observe them feed from quite close quarters. Numerous people were walking by enjoying the coastline in the early morning while they fed on the reef. We encountered several other Sooty Oystercatchers on our trip, but this was the only family group. What a lovely post. They are such special birds, Clare! 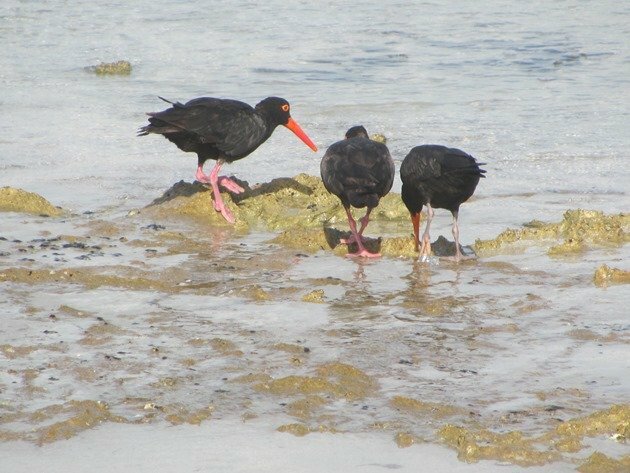 Just today I heard and then saw three of our local Black Oystercatchers. That’s often the case, as they communicate loudly with each other when they get separated, or even when they’re flying together. Ours look much like yours, black claws and all, but their pink legs aren’t quite so bright pink. 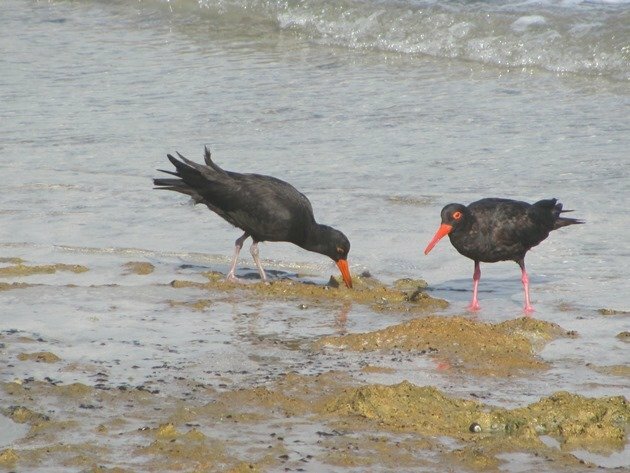 Wendy, They remind me very much of the Black Oystercatchers back home, that you are seeing! 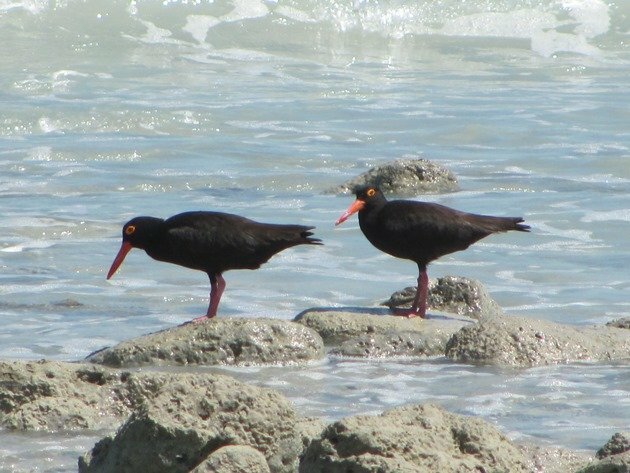 Wendy and Tom….Oystercatchers are always great birds to see!